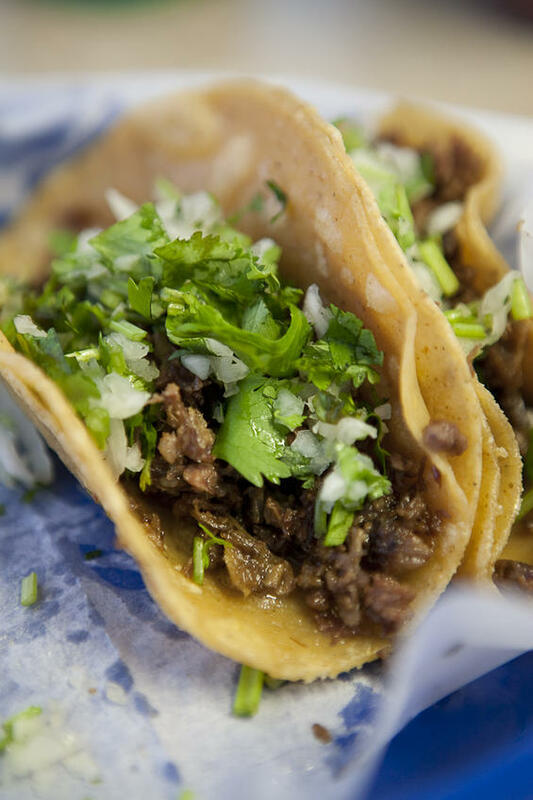 Street tacos (like the ones crafted out front of the Staples Center in Los Angeles) are made from simple fresh ingredients. Heat up a grill pan and drizzle a bit of oil on top. Chop the meat into strips, salt, and rub with garlic. Leave it alone for a few minutes before flipping. The goal is to crisp the meat a bit. Warm the tortillas in the microwave for about 45 seconds (stacked and wrapped in a paper towel). Arrange the tortillas on a platter, fill with the meat, onion, and cilantro. Cheese and salsa garnish is optional. If you can find fresh corn tortillas, this recipe will be even more delicious! If you’d rather make 6 larger tacos, double up on the tortillas (still using 12 total).